Mr. Montgomery has tried and settled hundreds of personal injury cases resulting in millions of dollars to his clients. In 2016 one of Mr. Montgomery’s clients received the largest jury verdict in Lafayette Parish history of 30 million dollars. If you have been injured in a car accident, it is crucial that you speak to an attorney immediately. You are entitled to fair and just compensation, let us help you obtain it. 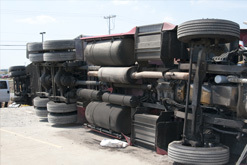 On our highways, trucking accidents are responsible for 1 in 8 traffic accidents. These trucks are so large that any accident involving them can leave a devastating impact. In order to cut operating costs, some trucking companies put travelers at risk by neglecting things such as vehicle maintenance and inspections. They may also cause danger by creating unrealistic deadlines for truck operators. These companies are large and have highly skilled insurance adjusters on their side. Let us help you get the compensation that you deserve. When alcohol is involved in causing an accident, the victim may be awarded additional compensation for damages, depending on the details of the case. Here in the south, the coast is part of our culture. With both recreational and occupational activities revolving around the water, boating and offshore accidents are very common. These accidents can be caused by the use of alchohol, lack of proper safety gear, and many other things. Whether your accident involves commercial or general aviation, Marshall Montgomery and his team can help. Over the past few years, cycling has become increasingly popular. With the increase of riding, comes the increase of accidents. Bicycle accidents can cause serious injury. Contact us to see what our team can do for you. The laws that surround workers compensation are strict and may not necessarily lean in the favor of the person injured. However, this is the only route that an employee can take when trying to receive proper compensation. Immediately following a work related injury, make sure to file an accident report and contact our offices for guidance on how to proceed. Wrongful death is the loss of a loved one due to an accident caused by another person. Though no amount of monetary compensation can replace a lost loved one, it can help ease the financial burden associated with this loss. A legal case is the last thing you should have to worry about during this difficult time. Contact us today and let Marshall and his caring staff take care of you.